In 2018 at Ignite Conference, Microsoft announced and released few major changes in the existing Azure certification paths. This announcement was referred to as the modern era of technology. The changes in the certification tracks were made to make the Azure certifications more role-based. Along with the arrival of the new Azure certifications path, the news contains the retirement of some of the existing Microsoft Azure exams at the end of 2018. Azure Fundamentals (AZ-900) is the foundational level exam in the new Azure certifications path. This exam is intended for those who want to demonstrate their basic knowledge of cloud services with Microsoft Azure. Even if you are from the non-technical background but if you have some basic understanding of the concepts of cloud, you can take this certification exam. This exam is considered as the first step in associate level and expert level Azure certifications path. Although it’s an optional step, validating your foundational knowledge will benefit you to some extent. Let’s have a look at the details of the Azure AZ-900 exam. Prerequisites: There are no particular prerequisites for the Microsoft Azure Fundamental exam but one should be familiar and have a basic understanding of the cloud services and the Microsoft Azure platform. Preparing for the Azure AZ-900 certification exam? Follow this AZ-900 exam preparation guide and get ready to pass the certification exam. For Azure Administrator Associate role, you need to pass two Azure certifications i.e. Exam AZ-100: Microsoft Azure Infrastructure and Deployment and Exam AZ-101: Microsoft Azure Integration and Security. After passing the AZ-100 and AZ-101 certification exams, you will become Microsoft Certified Azure Administrator Associate and will receive a badge of Azure Administrator Associate. If you are the one who has already passed the 70-533 exam, then you just need to pass the Exam AZ-102: Microsoft Azure Administrator Certification Transition to validate your knowledge as Azure Administrator Associate. Then, you will receive the badge of Azure Administrator Associate. Note that exam 70-533 has been retired on December 31, 2018. Also, the Exam AZ-102 will remain open for a limited period i.e. till June 30, 2019. Now, let’s have a look at the details of these new exams for Azure Administrator role. Microsoft Azure Infrastructure and Deployment exam is the first exam under the Azure Administrator role in new Azure Certifications path. Administrators will be responsible for networking, security, storage, and cloud computing. You should have prior knowledge of Azure applications, Operating Systems, Cloud and Storage Infrastructure. You should also have a basic knowledge of networking components and virtualization tools. If you know PowerShell and the Command Line Interface, then it will be an added advantages. Preparing for AZ-100: Microsoft Azure Infrastructure and Deployment exam? Read this AZ-100 Preparation Guide and start your preparation. Microsoft Azure Integration and Security exam is the second exam under the Azure Administrator role in new Azure certifications path. This certification requires knowledge in cloud services with storage, networking, and security. Prerequisites: Prerequisites for Microsoft Azure Integration and Security certification are the same as that of the Exam AZ-100: Microsoft Azure Infrastructure and Deployment. But for AZ-101 exam, you have to first clear the exam AZ-100. Preparing for AZ-101: Microsoft Azure Integration and Security exam? Go through the AZ-101 Preparation Guide and follow the right track for your preparation. Microsoft Azure Administrator Certification Transition is for those who have already taken the exam 70-533. In the new Azure certifications path, the old 70-533: Implementing the Azure Infrastructure Solutions Exam has been retired on December 31, 2018. And to validate the 70-533 certification, candidates need to take the AZ-102 exam. Prerequisites: Prerequisites for Microsoft Azure Administrator Certification Transition are the same as that of the AZ-100 and AZ-101. Also, one must have passed the 70-533 certification exam to pursue this certification. Have already passed the 70-533 exam? Read this AZ-102 Preparation Guide and start your preparation to become Microsoft Certified Azure Administrator. For Azure Developer Associate role, you need to pass only one certification Exam AZ-203: Developing Solutions for Microsoft Azure. After passing the certification exam for AZ-203, you will become Microsoft Certified Azure Developer Associate and will receive a badge of Azure Developer Associate. AZ-203: Developing Solutions for Microsoft Azure exam released on September 24, 2018. Developing Solutions for Microsoft Azure exam (AZ-203) comes also under the Azure Developer Associate role. Whether you have already passed the 70-532 exam or not, you will receive the badge of Microsoft Certified Azure Developer Associate on passing AZ-203 exam. Note that, previously, Microsoft launched Exam AZ-200 and Exam AZ-201 exam for the Azure Developer Associate Role. But now Microsoft has discontinued AZ-200 and AZ-201 exams and replaced them with AZ-203 exam as per the feedback on the beta versions of AZ-200 and AZ-201 exams. Preparing for Exam AZ-203: Developing Solutions for Microsoft Azure exam? Follow this AZ-203 Exam Preparation Guide and start your preparation. If you are the one who has already passed the 70-532 exam, then also you just need to pass the Exam AZ-202: Microsoft Azure Developer Certification Transition exam. Then, you will receive the badge of Azure Developer Associate. Microsoft Azure Developer Certificate Transition is for those who have already passed the exam 70-532. Prerequisites: Prerequisites for Microsoft Azure Administrator Certification Transition are the same as that of the AZ-200 and AZ-201 (the certifications that have been retired now). Also, one must have passed the 70-532 certification exam to pursue this certification. Have already passed the 70-532 exam? Read this AZ-202 Preparation Guide and start your preparation to become a Microsoft Certified Azure Developer. As per new role-based Azure certifications path, for Azure Solution Architect Expert role, you need to pass two certifications – Exam AZ-300: Microsoft Azure Architect Technologies and Exam AZ-301: Microsoft Azure Architect Design. After passing the certification exams for AZ-300 and AZ-301, you will become Microsoft Certified Azure Solution Architect Expert and will receive a badge of Azure Solution Architect Expert. If you are the one who has already passed the 70-535 exam, then you just need to pass the Exam AZ-302: Microsoft Azure Solutions Architect Certification Transition to validate your knowledge as Azure Solutions Architect Associate. Then, you will receive the badge of Azure Solutions Architect Expert. Note that exam 70-535 has been retired on December 31, 2018. Also, the Exam AZ-302 will remain open for a limited period i.e. till June 30, 2019. Now, let’s have a look at the details of these new exams for the Azure Solutions Architect Expert role. On September 24, 2018 – Microsoft released the beta version of Microsoft Azure Architect Technologies (AZ-300). This certification comes under the Azure Solutions Architect Expert role in the new role-based Azure certifications path. You need to pass the AZ-300 exam first to become an Azure Solutions Architect Expert. It provides knowledge in architecting solutions that are reliable and secure. Note that the beta version for AZ-300 exam has been retired now. You should have knowledge of security, identity, data management, and IT operations. One year of experience is also required for this certification. You should also have knowledge of DevOps, Azure development and Azure administration. Preparing for Azure Exam AZ-300: Microsoft Azure Architect Technologies exam? Follow this AZ-300 Exam Preparation Guide to give your preparation a new edge. Microsoft also released Microsoft Azure Architect Design (AZ-301) in beta on September 24, 2018. This certification also come under the Azure Solutions Architect Expert role in new role-based Azure certifications path. After AZ-300 exam, you need to pass AZ-301 exam to become an Azure Solutions Architect Expert. Prerequisites: Prerequisites for Microsoft Azure Architect Design (AZ-301) are the same as in Microsoft Azure Architect Technologies (AZ-300). But one should have passed AZ-300 exam to take the AZ-301 exam. Preparing for Azure Exam AZ-301: Microsoft Azure Architect Design exam? Follow this AZ-301 Exam Preparation Guide to give your preparation a new edge. Microsoft Azure Solutions Architect Certification Transition (AZ-302) also comes under the Azure Solutions Architect Expert role. AZ-302 exam is for those who have already passed the exam 70-535. Prerequisites: Prerequisites for Microsoft Azure Solutions Architect Certification Transition (AZ-302) are the same as that of the AZ-300 and AZ-301 exam. Also, you must have passed the 70-535 certification exam. Preparing for AZ-302 Exam: Microsoft Azure Solutions Architect Certification Transition? Follow the AZ-302 Exam Preparation Guide and become a certified Azure Architect Expert. One who has already received the badge of Azure Administrator Associate or Azure Developer Associate can become an Azure DevOps Engineer Expert. Whether be the Azure Administrator Associate or Azure Developer Associate, they need to pass Exam AZ-400: Microsoft Azure DevOps Solutions to become Azure DevOps Engineer. Let’s have a look at the details of the AZ-400 exam. Microsoft also released Microsoft Azure DevOps Solutions (AZ-400) – BETA Version in beta on September 24, 2018. This certification also come under the Azure DevOps Engineer Expert role. After receiving the badge of Azure Administrator Associate or Azure Developer Associate, one needs to pass the AZ-400 exam to become an Azure DevOps Engineer Expert. Ability to design and implement DevOps practices for infrastructure as code, version control, configuration management, compliance, release, build, and testing with the use of Azure technologies. Note that the Exam AZ-400 is currently in beta state. Preparing for AZ-400 Exam: Microsoft Azure DevOps Solutions? Follow the AZ-400 Exam Preparation Guide and become an Azure Certified DevOps Professional. There are 7 other newly launched or modified Microsoft Azure certifications that contribute credit towards MCP, MCSA or MCSE. Let’s have a quick look over these new Microsoft Azure certifications. The exam 70-473 is intended for those who have expertise in designing and implementing Microsoft data platform solutions. The candidates should have some relevant experience with cloud-based platform solutions. The exam 70-473 includes the exam objectives such as Design and implement database solutions for Microsoft SQL Database and Microsoft Azure SQL Server (20-25%), Design for high availability, scalability, and disaster recovery (25-30%), Designing and Implementing Security (25-30%), and Monitoring and Managing Database Implementations in Azure (25-30%). Note that the exam 70-473 will be retired on June 30, 2019. The exam 70-475 is intended for the data architects, data scientists, data management professionals, and data developers who are experts in designing big data analytics solutions on Microsoft Azure. The candidates are required to have some significant work experience in big data analytics solutions. The exam 70-475 includes the exam objectives such as Designing big data real-time processing solutions (30-35%), Designing big data batch processing and interactive solutions (30-35%), Operationalizing end to end cloud analytics solutions (30-35%). Note that the exam 70-475 will be retired on June 30, 2019. The exam 70-487 is intended for the developer who has a minimum of 3-5 years of experience in developing web services along with at least one year of experience in developing Azure solutions and web APIs. The exam 70-537 is intended for the infrastructure administrators and service administrators who provide cloud services by using Microsoft Azure Stack. The candidates should have some significant experience in operating and managing Azure Stack environments. The candidate should also have an understanding of hybrid cloud resources, Windows Server 2016, and Microsoft Azure. The exam 70-537 includes the exam objectives such as Configuring IaaS and PaaS for an Azure Stack Environment (25-30%), Deploying and Integrating an Azure Stack Environment (20-25%), Monitoring and Maintaining an Azure Stack Environment (20-25%), and Providing Services to and Enabling DevOps for Azure Stack Tenants (25-30%). The exam 70-774 is intended for the data analysts or data scientists who are experts in building and deploying intelligent solutions using Azure cloud services. The candidates should have good knowledge of machine learning, Azure data services, and data science processes. The exam 70-774 includes the exam objectives such as Developing Machine learning Models, Preparing Data for Analysis in Azure Machine Learning and Export from Azure Machine Learning, Using Other Services for Machine Learning, and Operationalizing and Managing Azure Machine Learning Services. The exam 70-775 is intended for the data architects, data engineers, data developers and data scientists who are responsible for the implementation of big data engineering workflows on HDInsight. The candidates should have some relevant work experience in big data analytics solutions. The exam 70-775 includes the exam objectives such as Implementing Big Data Batch Processing Solutions, Administrating and Provisioning HDInsight Clusters, Implementing Big Data Real-Time Processing Solutions, and Implementing Big Data Interactive Processing Solutions. Note that the exam 70-775 will be retired on June 30, 2019. The exam 70-776 is intended for the candidates who are responsible for designing analytical solutions and building operationalized solutions on Azure. The candidates should have some relevant work experience in handling data engineering issues. The exam 70-776 includes the exam objectives such as Designing and Implementing Analytics by Using Azure Data Lake (25-30%), Designing and Implementing Cloud-based Integration by using Azure Data Factory (15-20%), Designing and Implementing Complex Event Processing by Using Azure Stream Analytics (15-20%), Designing and Implementing Azure SQL Data Warehouse Solutions (25-30%), Managing and Maintaining Azure SQL Data Warehouse, Azure Data Factory, Azure Data Lake, and Azure Stream Analytics (20-25%). How to Prepare for New Microsoft Azure Certifications? To prepare for new Microsoft Azure certifications, Online classes and classroom training are the best way to get prepared. After certification training, you can also take practice tests for this certification on various platforms. Below are the few steps you can choose to prepare well for the new Microsoft Azure Certifications Path. Go through the exam detail: You can obtain information about the certifications that come under the new Microsoft Azure Certifications Path. This will be helpful for you to check the criteria. Check Course Content and Prerequisites: Course content is the key aspect to prepare for any Azure certifications. You should also check prerequisites before opting the new Microsoft Azure Certification Path. Check Exam Overview: Exam overview contains exam information, objectives, and domains. Before opting Microsoft Azure certification training, check exam overview. Take help of Exam Guide: To know more deeply about Microsoft Certification roadmap, also take help of the exam guide. It will help you to understand the various components of the Microsoft Azure Certification Path. Study Certifications Whitepapers: Whitepapers are the key points to prepare for the Microsoft Azure Certifications Path. You should study certification Whitepapers to clear your view about the exam objectives in the Microsoft Azure Certification Path. Read recommendation books: To know more about Microsoft Azure Certifications, you must read the recommended books. It will be great to follow instructions given in books to follow Microsoft Azure Certifications Path. Take sample questions and practice tests: After preparing for the new Azure certifications path, you can also check sample questions and take practice tests. Still confused! If you are willing to have a career in Microsoft Azure Certifications, then you must know the future scope of them. As the certifications involve cloud capabilities so it is highly recommended to choose these certifications in your azure career path and pursue these certifications. These certifications comprise security, networking, reliability, storage, Integration and administration aspects. If you were confused about ‘which azure certification should I do first’ this article would have helped you. You can also write your queries in the comment section. We will be happy to assist you to understand the latest Azure certification path along with the azure career path. 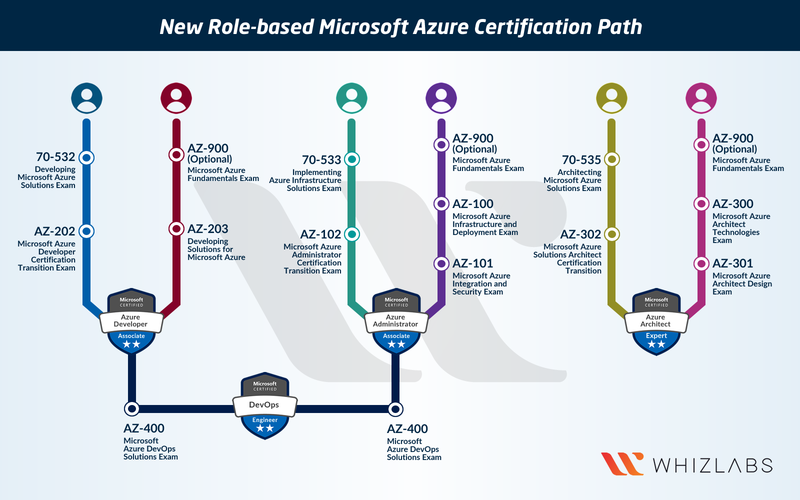 If you are preparing for these new role-based Azure certifications, Whizlabs Azure Certifications training courses will help you prepare and pass the new Azure certifications. Join us now to become a Microsoft Certified Azure professional.